Volcanoes fascinate me. Last year I was thrilled to be in Iceland when Bardarbunga started erupting and I got a thrill when I could see the explosions of lava shooting in to the air during my few nights in Myvatn. 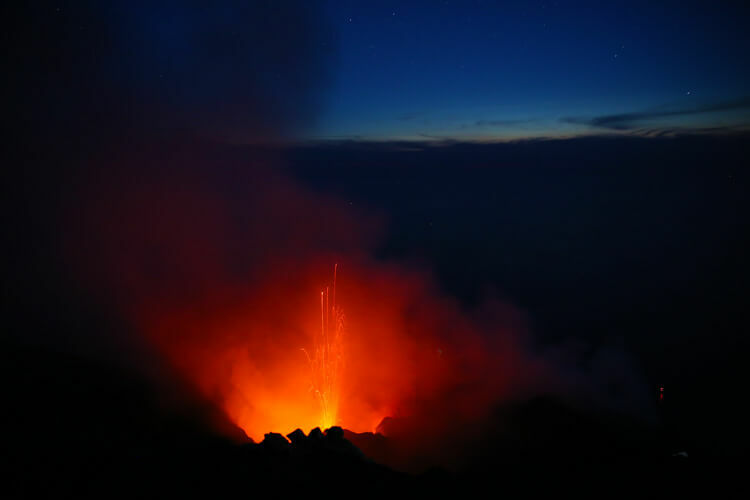 When I heard that you could trek up one of Italy’s three active volcanoes at nighttime to capture the lava spewing in to the air meters from you, I knew I had to do this adventure. Hiking Stromboli sat on my bucket list for nearly six years…until this week. The trek starts from sea level and climbs up an ever changing terrain. I met my guide, Tom, from Volcano Adventures and he reassuringly explained that we’d make the trek in stages. From the village we followed a path as it gently climbed upwards toward the entrance to the nature reserve. Already 30 minutes in to what is an eight hour trek, Tom pointed to a tiny bar and let our small group know that this was the last place for a proper bathroom and to top up your water. Next we were headed to 390 meters. With the late afternoon sun blazing overhead and hardly a cloud in the sky, I was thankful that even an active volcano that has been in nearly continuous eruption for 2000 years has vegetation on its base. The shade from tall bamboo, small trees and even out-of-control pricker bushes offered relief from sun beating on us. The trail zig-zagged up Stromboli and I counted down the 14 switchbacks one by one as I rounded each bend. As we emerged from the vegetation on the very last switchback, I was already rewarded with a spectacular view that I couldn’t see from the village. Stromboli had a bigger eruption with a lava flow that began August 4, 2014. 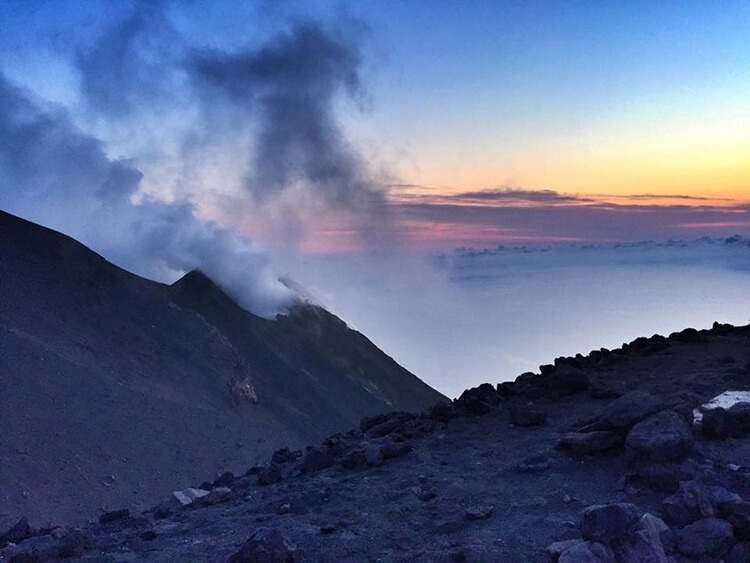 The lava flowed from the crater right in to the Tyrrhenian Sea and I stood gazing at the still steaming trail. A few sips of water and a few photos later, it was time to keep moving. We needed to reach the summit before sunset and we weren’t even a quarter of the way up. Here the terrain began to change and the steep climb up demanded bigger steps. Gone was the mostly even path and now we picked our way up rocks. Nature’s stair master was testing my legs as I powered myself upwards. This was the section of the trek Tom claimed was the most demanding for him and I was glad to finally reach 390 meters, where we took the first short break. It was also here at 390 meters that our guide from the Riserva Naturale Orientata met our group. From this point, it is require to have a local guide and from here on out our guide, Mario, was in constant contact with control as they monitored eruptions and our location to ensure safety. We prepared for the next section of the trek by stuffing everything, including our helmets, in to our backpacks. The vegetation was thick on this next section and we’d be ascending 100 meters every 10 minutes. It was steep and my legs began to feel the burn, but I trudged onwards. Three hours and 700 meters in to the hike and my legs were already exhausted. We reached a rock face and with no shame, I used my hands to bend over and scramble up it. The lights began to twinkle from the village below and sulfur fumes danced on the air. We were getting close and I could finally see the first hikers up on the ridge above the crater. The temperature drastically changed as we reached the first shelters directly across from the crater. Every so often the crater emitted a sound like water when it starts to boil, punctuated by a boom. We listened to these periodic explosions while watching the sun set and snacking on a Clif bar and beef jerky. Finally Mario received clearance for our group to ascend the last bit up on to ridge. This was the worst part of the trek for me personally. The terrain was nothing but soft black sand and as I sank several inches with each step, my feet felt like I had concrete blocks strapped to them. For the first time on the hike, I thought to myself “I just can’t do this.” But there was no turning back. I only had a few meters to go and the way down was on the other side of this tortuous sand dune. The trek is tough. There were moments when my legs burned so much that I thought I would crumple to the ground at any second. But as night fell and I got my first view of the magma bubbling in the crater below me, I forgot how exhausted I felt. I was, completely mesmerized, as every couple of minutes the lava fragments exploded in to the air. Unfortunately, the biggest explosion happened just after I had packed up my camera and tripod in preparation for the hike back down. The hike down is dark and dusty as we practically skied down through the sand. I was so glad that I had packed that extra flashlight in addition to my head lamp. The lights of the village crept closer and closer and soon enough we were back at the beach. There isn’t much to do on Stromboli aside from hike the volcano. The island, the furthest in the volcanic Aeolian Islands archipelago, has a population of just 500. Much of the island is inhabitable with the stratovolcano in nearly constant eruption for the last 2000 years. We arrived on the ferry just before lunch time and had plenty of time to explore the village and enjoy a much needed lunch before starting the hike in the late afternoon. Stromboli can be reached by ferry from Sicily in about 3 hours. Siremar and Ustica both have ferries that run to Stromboli, though ferries are not frequent except in the summer period from late June through September. Stromboli is a car free island. The Hotel Ossidiana is conveniently located 100 meters from the port. Rooms are basic, but comfortable with excellent air conditioning. 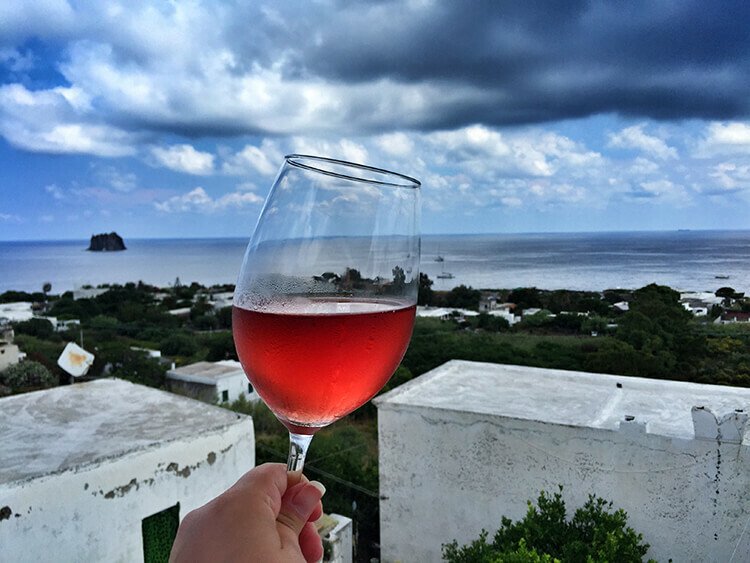 Da Luciano promises the best terrace view in Stromboli village and it definitely doesn’t disappoint. The food is delicious with a changing menu based upon the fresh catches of the day. 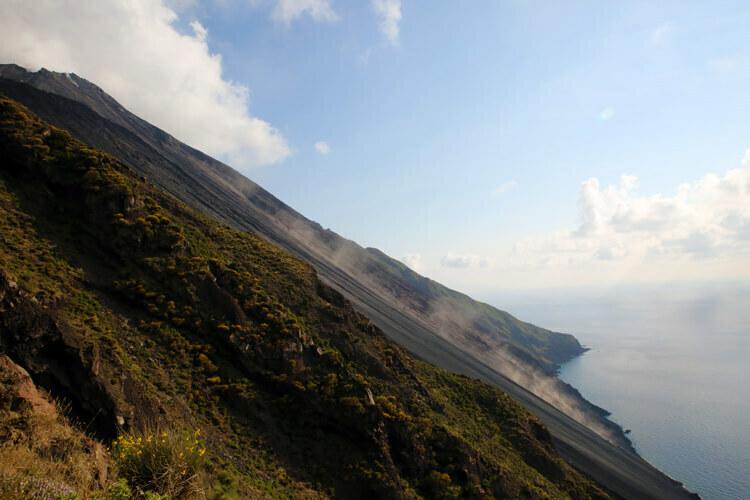 Stromboli is strictly regulated and you must go with a guide if you plan to hike beyond 390 meters. We recommend Volcano Adventures as the treks are lead by trained geologists and volcanologists. 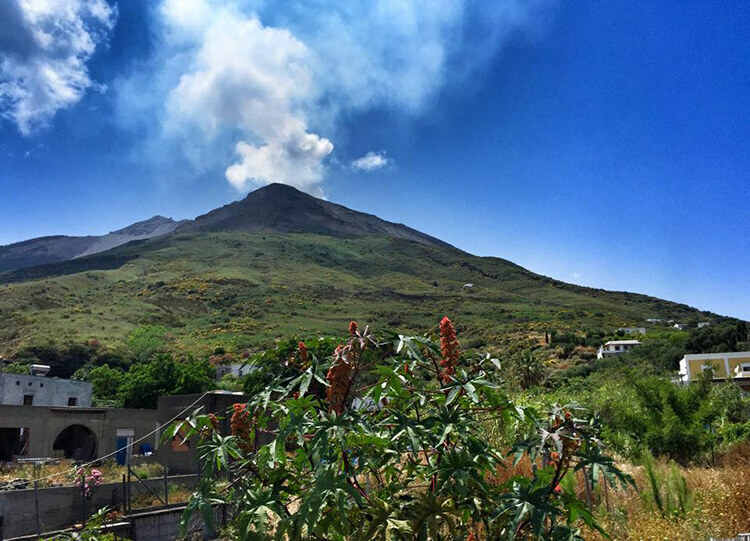 The Stromboli trek starts from €40 per person and includes the local guide, booking fees and helmets. Bring an extra shirt and a jacket or fleece as the summit is quite cold, even in summer. Bring a head lamp and a small flash light. It is very dark on the descent and the village streets are not illuminated. Carry a minimum of 2 liters of water per person (I drank 3 liters), some snacks like Clif Bars, a piece of fresh fruit or beef jerky. Hotel Ossidiana has a mini fridge in each room. Pick up a sandwich or a take-away pizza and put it in your fridge for when you get back from the hike. You’ll be starving and not much is open when you get back at midnight! 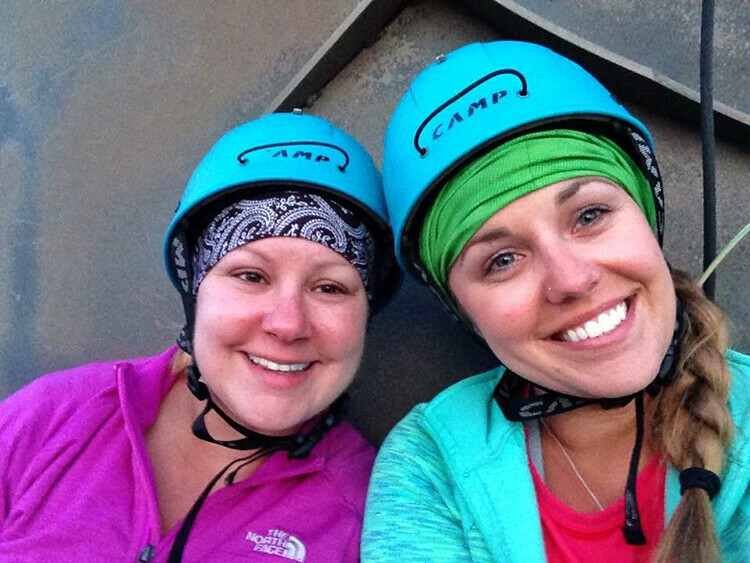 We were invited guests of Volcano Adventures in order to bring you this story. However, Luxe Adventure Traveler maintains full editorial control of the content published on this site. As always, all thoughts, opinions, and enthusiasm for travel are entirely our own. I bet you could, Natalie. I definitely could have been in better shape and it would not have felt as tough as it did. I think I need to be much fitter before attempting this!! I definitely wish I’d gotten in shape before attempting this hike. It’s no walk in the park. My legs were like jello after.